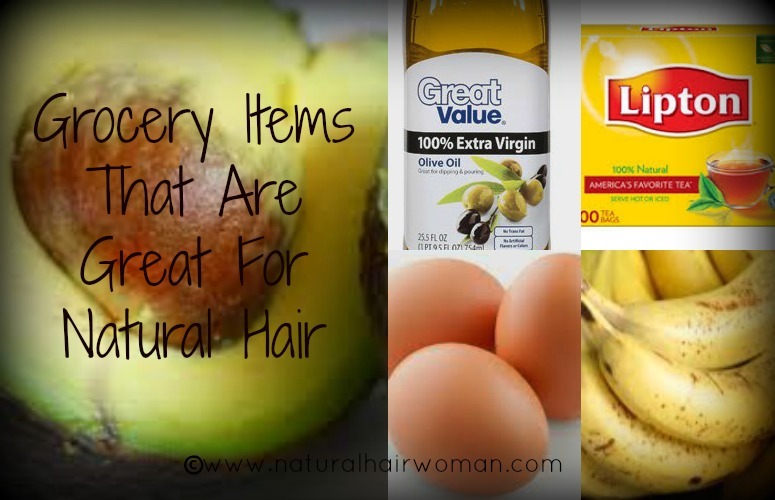 I frequently buy a lot of items from the grocery store for my natural hair. These items help to make my natural hair strong, soft and shiny. Here are some of the items that I stock up on and their uses. Extra virgin olive oil , coconut oil, grapeseed oil, avocado oil and many more. – They are used to seal hair after moisturizing. I use all these oils to make homemade deep conditioners, to make hair cream mixes and for pre poos and hot oil treatments. Peppermint oil, tea tree oil, lavender oil and many others – These oils have to be diluted with a carrier oil like extra virgin olive oil. They can also be used as preservatives for homemade mixes. When mixed with other oils and moisturizers, they help to eliminate dandruff and an itchy scalp. Apple cider vinegar – Can be used as a homemade shampoo. It helps to reduce frizz, makes hair shinier, seals cuticles and stimulates the scalp to promote hair growth. Bananas and avocado – Has natural oils that hydrate and add moisture to hair. Also used to make homemade deep conditioners. Black tea, green tea – Reduces hair breakage and shedding. Coffee – Used to add a natural color to hair. It also reduces shedding. Yogurt, Eggs, mayonnaise, coconut milk – Great source of protein, makes hair more manageable and leaves hair soft and shiny. Also used in homemade deep conditioner mixes. Aloe vera juice – Contains enzymes that promotes hair growth, reduces redness, scaling, itching of the scalp, helps to bring hair’s PH to a more desirable level so as to retain moisture. Plastic bags – Used in place of a shower cap. A great way to save. Have you experimented with these items on your natural hair? What are your favorites?